Hello, summer! Along with a welcome opportunity to enjoy the outdoors, this lovely season brings additional need for caution when caring for an Alzheimer’s patient. Dehydration is a risk at any time of year, but during the summer, Alzheimer’s caregivers need to be especially watchful. The following five reasons put Alzheimer’s patients at extra risk of dehydration. They forget. The forgetfulness associated with Alzheimer’s can mean that a senior can feel thirsty, but simply forget to drink. Their medications cause them to lose fluids. Many prescription medications have diuretic effects. This, added to the heat of a summer day, can easily lead to dehydration. They have a fear of water. Hydrophobia is a common symptom of Alzheimer’s. This can result in a high level of anxiety around water-related activities, such as drinking. They have trouble with reasoning skills. In middle-stage Alzheimer’s, a senior might realize they are thirsty, but not know what to do about it. They have difficulty swallowing. 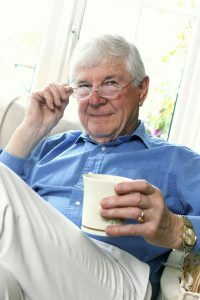 Dysphasia, a late-stage Alzheimer’s symptom, can cause a reluctance to drink. By keeping closer watch on their charges, Alzheimer’s caregivers can ensure that summer remains a relaxing and fun-filled time. Tower Lodge offers an Alzheimer’s/Memory Impaired Care Unit, where our carefully selected nurses provide residents with care that is professional, attentive, and compassionate. Contact us to see how we can help you take the best possible care of your loved one.